Planning a visit to New York City? Explore NY with seasoned city historian, Joyce Gold. Schedule a guided tour where each tour is a unique experience tailored to the interests and requests of the individual or group. Joyce shares accurate, interesting information with wonderful details and stories with a historical twist that will delight any group. Custom tours begin at $295 for up to 6 people. Contact Joyce for details. 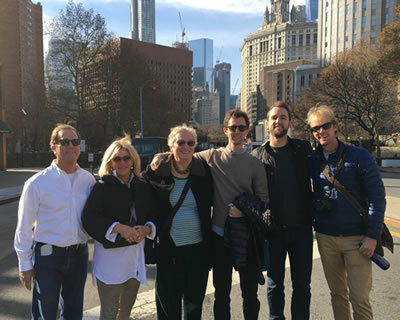 » CORPORATE TOURS — Joyce Gold specializes in providing high-level, enjoyable tours for corporate clients. » BUS TOURS & OTHER VEHICLE TOURS — Bus Tours and other vehicle tours allow groups to cover several neighborhoods on one tour. » PUBLIC SCHEDULED TOURS — View the current schedule. Contact Joyce for more information about planning your own private tour. The Dutch settlement only lasted 40 years, but those strong-minded tradesmen left their mark in a district where people from all over the world come to buy low and sell high. This lively history walk follows the streets used by Manhattanites for 384 years. It introduces visitors to the oldest part of the city and shows how the metropolis and the center of world finance came to be what it is today. These days, enormous shifts have come to the neighborhood. Dozens of skyscrapers have gone residential, and new restaurants are flowering. We will examine the new changes in a historic context, and explore the areas of greatest change and potential. Alexander Hamilton immigrated to British Colonial New York as a young, orphaned nobody, but quickly rose to be an influential player in the Revolutionary War and the founding of the United States of America. On the southern tip of Manhattan, Hamilton lived, studied, worked, and served to create a financially robust nation in good standing with the international community. Today’s Financial District was the setting for much of Hamilton’s career. In 1654, 23 Jewish men, women, and children arrived in Dutch New Amsterdam. Settling into their new life included adapting to restrictions imposed by the frontier town, and dealing with subsequent Jewish arrivals with traditions different from their own. Their immediate concern was how to earn a living when many occupations were closed to them. During the Dutch and British periods groups of Jews arrived from a variety of countries. The process of their making Manhattan a home involved creating a place to pray, providing kosher food, keeping their children within the faith, and balancing the interests of Sephardic and Ashkenazi residents. Before the American Revolution, New York City was a Tory stronghold with commercial, religious, and cultural ties to England. But there was also a strong undercurrent opposing England’s rule. The Sons of Liberty gathered secretly to plan trouble, and rebellious colonists pulled down the statue of King George III in Bowling Green. In 1776 after the Battle of Brooklyn, the retreating Americans set fire to much of the city destroying large sectors before the English could take control. Spy Nathan Hale was captured and hanged in Manhattan. At the war’s end, after the English evacuated the city, George Washington bade farewell to his troops at Fraunces Tavern. He was inaugurated at Federal Hall, and Alexander Hamilton served as first Secretary of the Treasury. The President prayed at St. Paul’s Chapel, brokers began the New York Stock Exchange, and royal street names like King St, Queen Street, and Crown Street were removed. Discover the first experiences in America of the 17 million people who fled Europe in ship steerage in hopes of finding a new life in a strange but promising country. (Governors Island is open to the public from May through September. Tours are possible only during those five months.) Governors Island is a prime piece of real estate just a short ferry ride from Lower Manhattan with phenomenal views of that skyline. Until recently the island was federal land and closed to the public. Today government, private interests, and the public are all involved in defining the future of this unique section of New York. In Dutch and British colonial times, the island was pasture, timberland, game preserve, and summer resort. For nearly two centuries after the American Revolution it served as guardian of the harbor and was in continuous military use. A visit today includes areas designated as national monuments, temporary art installations, and activities from jazz concerts to children’s activities to biking in a car-free environment. It’s a visit to quiet, green, and open-spaces. The big question to consider is — what lies ahead? Recovery from the infamous September 11, 2001 attack has redefined this part of the city. The monumental task of redesigning the World Trade Center site has epitomized the struggle among competing interests vying for influence and control over this historic re-working of Manhattan’s oldest district. Site by site, developers, governments, 9/11 families, growing numbers of residents, the business community, and numerous others have all clashed and compromised to redefine the future there. How is the area changing? Will the new neighborhood be an improvement? Will the new architecture uplift our sense of purpose and the perception of the tragedy? What memorials and memories will remain of 9/11? When have Americans across the country affected what happens here? Will tourists overwhelm the neighborhood? How will security measures affect the atmosphere of the newly diversified district? These are some of the issues that you can explore on this challenging new tour. Just east of today's City Hall and Municipal Building, this was once a foul-smelling, disease-ridden district. Brought to life in the movie Gangs of New York, it was a place of violence, gang wars, poverty, and corruption. The district evokes such places of notoriety as Paradise Square, Cow Bay, Bottle Alley, and such gangs as the Roach Guards, Plug Uglies, Shirt Tails, Dead Rabbits. From flashy district of vaudeville, minstrel shows and operettas, to raucous saloons, bare-knuckle boxing, and Skid Row, the still-changing Bowery has seen it all. Rural to the 1800s, the street evolved into a flashy entertainment district for the working class. During the Civil War the Bowery was a center of New York's theatrical life. Here vaudeville began and minstrel shows became popular. H.M.S. Pinafore and the stage version of Uncle Tom's Cabin debuted on the Bowery. By the 1870s raucous saloons combined socializing and bare-knuckled boxing for entertainment. Though the street's fortunes declined, its venues at the turn of the last century were the early training grounds for such greats as Irving Berlin, Eddie Cantor, and George M. Cohan. The 1892 The Bowery song with its humorous view of a tourist's being ripped off popularized the street as a disreputable place. The Depression of the 1930s cemented its reputation as Skid Row for people who had lost all hope. With the late CBGB home of Underground Rock, and more recently the luxury Bowery Hotel and the New Museum, the Bowery's identity is changing again. Discover the graves of African slaves, the first Jewish settlers, and founders of the American Republic still in the heart of the Financial District. Tribeca’s industrial past remains visible in its cast iron buildings & raised loading docks. Although reconfigured into residential lofts and hotspots of food, film, and design, these industrial buildings facing Belgian block streets retain the character of their original use. This historic district was once a great estate. In the late 19th century wholesale distribution businesses organized in the area, a center for meat and produce, cheese, butter & eggs, and huge warehouses. Replacing deserted piers along Lower Manhattan's Hudson River shoreline, Battery Park City has emerged as a remarkable living space. Its 92 acres of landfill were developed by the Battery Park City Authority, an innovative group of public and private advocates. The secret of Battery Park City's success is its integration of public amenities and private initiatives in artistically-designed natural landscapes, including hills, secret paths, and glorious panoramas. Since its opening in 1883 the bridge has been praised for its innovation, its beauty, and the scene from its raised walkway. It has been an icon of New York City and still evokes amazement for its engineering, its beauty, and the views from its raised, wooden walkway. Poets, novelists, filmmakers, and painters have celebrated it, as “a living connection” of architectural grace and strength. Just north and east of today’s City Hall and Municipal Building there are neighborhoods that in the nineteen century were densely packed with immigrants from Ireland, China and Italy, struggling against poverty, disease, prejudice and violence. This tour traces the reasons behind the mass immigrations of Irish, Chinese and Italians to New York, and their diverse experiences upon arrival. What were the advantages of coming here? What were the difficulties each group faced, and what effect does this history have on the character of the city today? We will visit historic landmarks, shops and eateries, and explore the texture of these overlapping neighborhoods. Today the Irish are gone from the area, Chinatown is growing, and Little Italy is contracting as area’s demographics continually shift. What will the future hold for each section, and what is the fate of these fascinating ethnic enclaves? Take a step back in time with a walking tour of the tenements, settlement houses, home life, literary culture, and religion of the early 20th century immigrants. This tour focuses on the period from the 1880s to 1930s when over a million and a half Jews, chiefly from Eastern Europe, crowded into this area, giving it the largest concentration of Jewish people in the world. Remnants of the institutions that improved the immigrants' lives survive, next door to their modern equivalents, which still strive to help people into this constantly changing neighborhood. The nineteenth century cast iron emporiums of Soho have witnessed the full cycle of new development, deterioration, and restoration. A leisurely walk through this picturesque New York area acquaints walkers with the legacies of generations of Soho residents — the immigrants who worked in retail in the 1840s and then in wholesale in the 1880s, and the artists and entrepreneurs who have helped create the current ultra-cool look of the region, sometimes literally by painting the walls. Why have such upscale retail outfits as Prada, Kate's Paperie and Bloomingdale's chosen this small, formerly industry-heavy part of town for retail branches? In what ways does the past affect the future here? And in what direction is Soho moving today? In its earliest years Greenwich Village was a refuge from the yellow fever epidemic downtown. By the early 20th century, the Village had become home to artists, writers, and playwrights looking for an unconventional environment and creative freedom. Protesters came here in their struggles for the vote for women, better working conditions, opposition to war, and gay and feminist rights. The new High Line Park began its life as an industrial elevated railroad that traveled above the street traffic and through the buildings it served. Today the new city park on the old rail-bed serves as an international model for creative reuse of industrial structures. We will climb the "slow steps" to see this amazing woodland, grassland, and urban wonderland and walk into the newly-opened extension of the remarkably-transformed space. It isn’t often that over a mile stretch of Manhattan waterfront becomes available for the development of commercial & residential innovations. But that is what happened when the meat market, freight and passenger ship travel left West Chelsea. The change began with the prospect of turning a long-unused set of elevated tracks into the High Line Park. Some of the world’s most prominent architects—Renzo Piano, Frank Gehry, Zaha Hadid—have designed spectacular structures here that make this neighborhood a world-class architectural destination. But one block west of its border, the neighborhood changes abruptly. Gone are the run-down remains of a long-disappeared waterfront commerce — transient hotels, cheap bars, and old factories. Now new glass-covered high-rise buildings rise with celebrity-filled condominiums and look out over a spectacular, transformed waterfront. Today the shoreline is alive again, this time with grassy playing fields, quiet lawns, children's playgrounds, and 800' long restored piers. Celebrate the Halloween season with some of the spookiest stories in New York — murders, hangings, explosions, famous missing persons, specters, hauntings, and ghosts. Death lies in plain view —if you know where to look. In few other places on earth have so many notable women lived and achieved. For the last 150 years, it has seen an unparalleled variety of women – working class, gentry, radical, literary, academic, theatrical, convict, and immigrant – remarkable women who left their imprints on the Washington Sq. neighborhood – and beyond. Italian priests, saints, shop owners, politicians and mobsters all contributed to the scene south of Washington Square. The South Village, the district south of Washington Square Park, is what most people picture when they think of Greenwich Village. Today much of the charm of the South Village comes from its many original Italian businesses, some started over 100 years ago and now run by the third and fourth generations. The enduring Italian presence may be because residents from southern Italy were slow to become Americanized, holding family and traditions close. Socializing primarily with people from their native part of Italy, they established churches, social clubs, workplaces, and other needs of daily life. The full story of the South Village includes African-Americans, Irish, and Italian priests, saints, shop-owners, politicians, and mobsters. Images of the neighborhood contribute to such films as Godfather II, Raging Bull, Serpico, and Moonstruck. The openness of Greenwich Village drew artists of all sorts including novelists, poets, playwrights, and writers of detective fiction, short stories, and muckraking exposés. Living and working in close proximity to one another, 19th and 20th century luminaries could find inspiration and good company in this bohemia. • Edna St. Vincent Millay, first women to win the Pulitzer Prize for poetry We will see where these authors lived and hung out, and examine how this literary community evolved over time. Beginning in the 18th century as one man's farm, this west Chelsea neighborhood is a beautiful enclave of elegant 19th century New York. Houses survive in the Federal, Greek-Revival, and Italianate styles. One centerpiece of the neighborhood is the 180-year-old General Theological Seminary of the Episcopal Church, still a picturesque center of learning. The new look in world-class architecture is also here — eye-catching structures by Frank Gehry, Annabelle Selloff, and Jean Nouvel. Art sites include such galleries as those of Matthew Marks, Pat Hearn, Morris Healy, and Annina Nosei. The newest museum on the block is the Chelsea Art Museum. After exploring these far-west streets, the tour ends at the newest work of art, the remarkably-transformed High Line Park. After hearing about its history and design, tour-takers can enjoy climbing up to see this "Jack in the Beanstalk" wonderland and the beautiful views within and around it. As the inevitability of the Civil War increased, New York faced conflicts within its varied population. Family connections with the South brought personal strife for some. Business interests dreaded the potential loss of Southern markets for finished goods. Ever present ethnic and class tensions increased. Once war was declared, New York officially supported the Northern cause. But as the war dragged on, ethnic and class tensions escalated between the Irish and blacks, and the poor and the governing class. Groups actively engaged with the war included shipbuilders, manufacturers, newspaper publishers, humanitarian philanthropists, and soldiers returning from battles. Discover a London Square that became home to creative minds, elegant salons, and the taste-setting Lady Mendl. Samuel Ruggles, lawyer, developer, and urban design visionary, purchased a piece of marshland in 1831 in order to create a park for local citizens. Over the next several decades, a private London square emerged, surrounded by substantial homes. This landmarked district became home to some of America's greatest inventors, architects, actors, doctors, diarists, publishers, writers, painters, and losing and winning presidential candidates. Hubs of political chicanery, Union Square and Madison Square were gathering places for sports fans, anarchists, vaudevillians, and 19th century fashionistas. The Squares were key stations along the steady movement north of residences, houses of worship, entertainment venues, retail stores, hotels, and political organizations. But they evolved along divergent paths. From the Civil War to World War I, political radicals, labor unions, and the Democratic Party used Union Square as a home base and platform for demonstrations and protests. The image of Madison Square reflected its wealthier residents, bosses of the Republican Party, and iconic early skyscrapers — the Flatiron Building and the Metropolitan Life insurance Building. Peter Stuyvesant, a Director General of the New Netherlands, was the first owner of the farmland now known as the East Village. Later, Irish laborers moved into the area to build ships along the East River. Germans also thrived here, until a tragedy resulted in the death of over 1000 of their people. As Germans left the neighborhood, Italian, Jewish, Polish, and Ukrainian immigrants moved in, bringing new life, food, and traditions. The neighborhood has been and continues to be home to Irish, Polish, Jewish, Ukrainian, German, and Italian populations. Its theaters, churches, shops, restaurants, and bakeries all reflect their diverse ethnic influences. Their foods reminded the immigrants of home, supported the spirit of their heritage, and helped give them the strength to become Americans. The tour can include stories of the groups, the foods, and the eateries, all while tasting our way through the neighborhood. A brand new city is rising in Midtown—the Hudson Yards. It covers 28 acres, between 30th & 33rd St, & from 10th Ave to West St & the Hudson River. Hudson Yards is a mix of 21st century architecture accessorized with a large interactive sculpture and a touch of gently-curved landscaping. Soaring over deep rail yards, this high-end corporate & residential development includes seven stories of retail shopping and restaurants. The Vessel—the 150’-high permanent art installation—attracts urban adventurers to its Escher-like spiral stairwells. The Shed, an ambitious cultural center, was built with a quilted, retractable shell that can open the space to the outdoors. Hudson Yards has precedents in Manhattan as a city-within-a-city—Battery Park City & Rockefeller Center. Each embodies its time and priorities. 100 years ago Grand Central Terminal opened to great acclaim. More than 150,000 people visited it on opening day. The dramatic new structure was a thrilling symbol of the fast-expanding commercial and intellectual reach of the second largest city in the world. A majestic Beaux Arts rendition of a classical form, Grand Central is impressive outside and within. A monumental sculpture crowns its 42nd Street façade. The Main Concourse has the soaring dimensions of a cathedral. The building seems to embody the huge purpose of the terminal — to move great numbers of people, to provide services for travelers, to outshine its rival, and to create a real estate boom with the innovation of air rights. Set in the middle of the East River, Roosevelt Island served as a place to pasture swine for the Dutch, and later as the Blackwell family farmland. In the early 19th century the city bought the island and for 100 years used it to house the unsavory services of prison and madhouse. In the last few decades, it has become a thriving mixed-income town built from a Master Plan. And major changes are on the way. Fleeing starvation during the Famine, Irish immigrants poured into New York City in the mid 19th century in search of a better life. One of the few jobs open to Irish men was back-breaking work on the docks. Hell's Kitchen faced the westside waterfront, a squalid, crime-ridden and overcrowded slum. Here the Irish families struggled to survive poverty and overcome discrimination. • Cattle pens and slaughterhouses on West 39th St.
Times Square — the area around Broadway from 42nd to 55th Sts. — is one of the hottest tickets in town. The spectacle and sparkle of Times Square draw millions of visitors each year, and looking back through its larger-than-life history it’s no surprise. • "Naughty, bawdy, gawdy, sporty 42nd Street"
The great buildings of New York — Empire State Building, Chrysler Building, Rockefeller Center, the Plaza Hotel, St. Patrick's Cathedral — and the people who helped create them. Just south of Grand Central Terminal lies this orderly, residential enclave, notable for its graceful non-commercial character. That orderliness and quiet demeanor was no accident. The Murray family controlled the development of their land, included limiting the sale of liquor, and keeping businesses out. From the days of banker and industrialist J. P. Morgan through those of newly-weds Franklin and Eleanor Roosevelt, Murray Hill has been the district of choice for the elegant mansions, beautiful brownstones, and enormous carriage houses of New York's elite, and has seen an extraordinary concentration of wealth and power. 150 years ago these 843 acres were manually restructured from a "filthy, squalid, and disgusting" site into a work of art at the heart of Manhattan, Olmsted and Vaux's first masterpiece of urban landscape design. Fast-growing, business-oriented New York City had largely ignored quality of life issues for its citizens. By the middle of the 19th century this omission had become so apparent that the city government arranged a competition for the design and creation of a great park. The winning design of Frederick Law Olmsted and Calvert Vaux transformed 843 acres into an educational, recreational, and horticultural marvel. • Where did they get all those trees? Many surprises await us just south of 110th St. The second largest lake in the park — the beautiful Harlem Meer —anchors a landscape unknown to many New Yorkers. It’s a place of open green lawns inviting strollers in from the sidewalk to enjoy the lake and paths, and the sharp outcroppings on the far side across the water. Here folks enjoy quiet fishing, hiking up the steep trails, watching turtles and birds, and learning in the Discovery Center. Immediately south of the Meer is a world unto itself — the strikingly beautiful 1930s Conservatory Garden, a treasured enclave we will enter and explore. The tour also covers such historic sites as Nutter’s Batter, Fort Clinton, and the original Polo Grounds baseball stadium. We will look out across Fifth Avenue and see the newest museum to join Museum Mile and evidence of the latest migration uptown. Rivalry between "old money" & "new money" filled the gossip pages of the Gilded Age newspapers. Old money dated from Dutch & British colonial times; new money flowed from the industrialization beginning with the Civil War. Between 78th Street and 92nd Street, Fifth Avenue still has a concentration of formidable Gilded Age mansions. The industrial age moguls who built these city chateaux were vying to outdo one another & flaunting their wealth & worthiness for all to see. Women of the new-monied class competed for social standing with clothing, parties, and aristocratic connections. • "Poor little rich girl"
The creation of Central Park in the 1870s destined Fifth Avenue — the park’s eastern border — to become one of New York’s most elegant addresses. Great historic mansions, including those of Henry Clay Frick and James B. Duke, began to line the avenue. Much of the wealth that created this Gold Coast was earned rather than inherited. The American Dream and its dark side reside even on Fifth Avenue. The creation of Central Park in the 1870s destined Fifth Avenue, the park's eastern border, to become one of New York's most elegant addresses. But as the wealth moved in, so did chicanery and violence. Great historic mansions housed both perpetrators and victims, sometimes both living together. • American tycoons with aristocratic yearnings. In the 1840s immigrants from the present Germany, Czech Republic, and Hungary came to America fleeing inflation, mass uprisings, and government repression. By the late 1860s two German entrepreneurs, Jacob Ruppert and George Ehret, built breweries in rural Yorkville near the East River. As people moved uptown for the brewery jobs, houses of worship, cultural centers, and commercial establishments arose. The neighborhood today has elements of a Middle European city, Vanderbilt money, Tammany control, and the Progressive movement. Today the new Second Avenue subway makes the entire neighborhood more accessible to all. Astute landowners kept property off the market until the 1880s when new transportation opened up the neighborhood. New laws and construction techniques produced the modern apartment concept. Real estate booms brought abrupt change to 19th century farmlands and a step up for aspiring achievers. New laws and construction techniques produced the modern apartment concept. Looking much the same for the past 75 years, Central Park West includes a great variety of architectural styles —Art Nouveau, Art Deco, Beaux-Arts, French Chateauwith subtle touches of castles, temples, and cantilevered terraces. • A great museum once called "a disgrace to the city"
• A solution to "the servant problem"
Once farmland and a battlefield, this district evolved into a center for learning, healing, and spirituality. In the 1820's the Bloomingdale Insane Asylum started the gradual transformation of these heights from farmland to the Acropolis of learning, healing, and spirituality. Unusual for Manhattan, this neighborhood was planned and financed as a cohesive center, for mind, body, and spirit. In the 1880s, the 9th Avenue elevated train was constructed, helping to realize the plan to make this area a choice location for a places of learning, hospital, and houses of worship. • Grant's Tomb — no one is buried there! The world’s largest cathedral, this amazing structure reaches out beyond traditional Christian themes to include important artistic representations of Jewish and secular images. In the 1880s, the new elevated railroad converted Harlem from a rural district into tracts of beautiful homes for wealthy New Yorkers. By the 1920s, downtown development and the new subway changed the neighborhood into one of the nation's most famous African-American communities. Harlem was once the third largest Jewish settlement in the world, after Warsaw and the Lower East Side. In the neighborhood more than 150,000 Jews listened to the great Yossele Rosenblatt chant Sabbath services and were terrified when gangsters like Lefty Louie Horowitz and Whitey Lewis fought gun battles on 125th St. They bought at Blumstein’s Department Store and saw teen-age singers Walter Winchell and George Jessel begin their careers. • Why did Jewish New Yorkers move to Harlem? • What was their reception? • How did they keep the children within the fold? • Are any synagogues still active in Harlem? Just across the Brooklyn Bridge from Wall Street, Brooklyn Heights is one of the most beautiful and charming in the city. It was the first district in New York to be awarded landmarks designation protection. Park Slope has long been Brooklyn’s quintessential residential neighborhood. Its 19th century mansions, churches, brownstone and brick row houses make it an impressive landmark district, the largest in Brooklyn. The 1873 opening of Prospect Park spurred the development of the area. When the Brooklyn Bridge opened 10 years later, it enabled people to move more deeply into Brooklyn without lengthening their commute to Manhattan jobs. Accustomed to flats and apartments, city dwellers saw in Park Slope a chance to own their own homes. Today the district is prized for its proximity to Prospect Park, varied architecture, restored stately homes and churches, and strong sense of community. The very definition of a well-rounded neighborhood, Park Slope has tree-lined streets, impressive front yard gardens, excellent public schools, scores of restaurants and bars, lovely shops, and a population of creative people. For almost 200 years the name "Gowanus" has been synonymous with putrid human & industrial waste. In 1911 a local politico described Gowanus Canal as, "a 5,700&apos;-long fetid groove renowned for its sometimes awe-inspiring stench, & a near-mythic level of contamination." Over the years cleaning up the canal surfaced as a necessity, so that gradual improvements raised awareness that Gowanus could become an appealing neighborhood, with a picturesque canal at its center. Pioneering artists and galleries, major clean-up campaigns, and a canoe club have all contributed to the continuing rehab of Gowanus into a place good for creativity, small business, homes, restaurants, and shops promising multi-use neighborhood. The small Brooklyn district of DUMBO was in its industrial heyday when the Erie Canal opened and steamships carried freight to and from its waterfront. Large scale manufacturing and warehousing thrived. But in the 1920s factories started closing, and gradually the neighborhood lost its vitality. In the late 1970s artists and other bohemians began settling quietly into the empty factory buildings. These residents brought a cachet to the area. Soon other creative entrepreneurs moved into the large loft spaces, and developers saw a great opportunity for new residential real estate. A remarkable concentration of immigrants has transformed this seaside corner of Brooklyn into a Russian village.